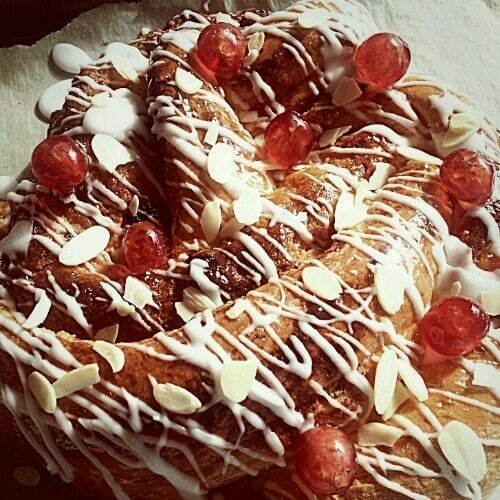 I had never even heard of couronne bread until I watched The Great British Bake off last Tuesday. Paul Hollywood‘s apricot version looked absolutely scrummy but I was desperate to try my own version. 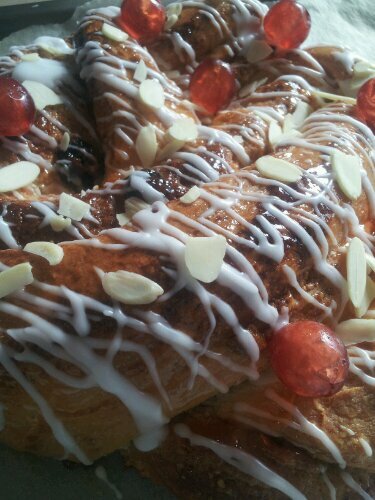 So here is my version inspired by cherry bakewell! To make the dough, tip the flour into a large mixing bowl. Add the salt on one side of the bowl and the yeast to the other. Add the butter, milk and egg and turn the mixture around with your fingers, incorporating the ingredients together. Keep mixing until you have a soft ball of dough. Turn the ball of dough out on to a lightly floured work surface and knead for 10-12 mins. The dough will be sticky but don’t be tempted to add more flour. Keep going until the dough is smooth and silky. Lightly oil a large bowl. Place the dough inside and cover with cling film or a tea towel. Leave to rise for around one hour or until doubled in size. Alternatively if you have a mixer, use it! I bunged everything in my KA and it took 5 mins. I enjoy kneading bread but for sticky doughs like this, I go for the mixer every time! For the filling, beat together the butter and sugar until light and fluffy. Stir in the ground almonds and flour. Add the egg, almond extract, amaretto and dried/glace cherries. Set aside. Turn the risen dough on to a lightly floured worktop. Roll out to a rectangle, around 25x33cm. Spread the cherry almond mixture evenly over the dough then roll up tightly like a swiss roll – tack the edge of the dough nearest to you down to the work surface so it won’t move, then roll up starting with the long edge away from you. Roll it back and forwards to seal, then cut lengthways in half, just stopping near the top of the dough. Twist the two strands of dough together, then twist the two ends together to make a “crown”. Carefully move to a baking sheet and cover with a large plastic bag. Prove for 30-45 mins until risen and the dough springs back quickly when you prod it. Bake for 25-35 mins until risen and golden. 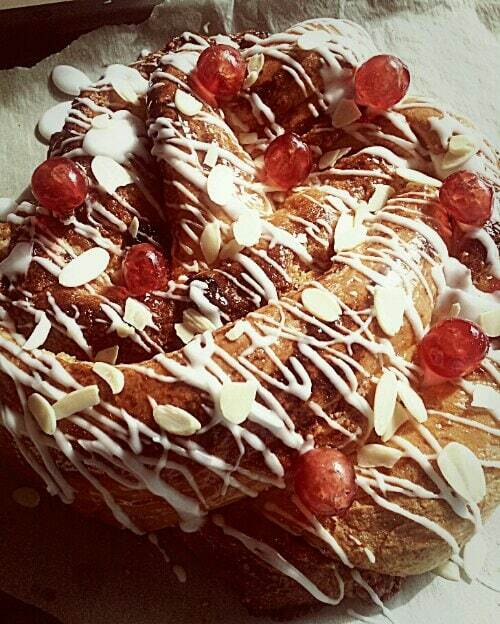 Gently warm the apricot jam and brush over the warm couronne. Make up your icing and drizzle over the loaf. Sprinkle with flaked almonds and cherries. You’re welcome, thank you for your kind comments 🙂 I just wish I had been able to participate in TGBBO more the past few weeks! that looks lovely….I bet it tasted gorgeous! thanks for joining in. Wow what a delicious cake, I want this now! 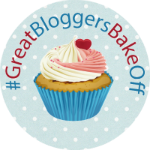 Thanks so much for linking up to #tastytuesdays, hope to see you next week! How beautiful! Do I smell Christmas? What a pretty, pretty bake! Thank you very much for entering TTT!